Condition is Used. 130 cms high by 103 cms wide. Vaux Brewery Beer Mat Collection includes 2 ushers &1 wards. 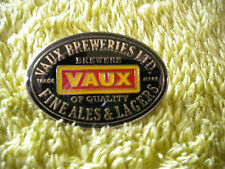 Vaux Brewery Beer Mat Collection includes 2 ushers &1 wards.. Condition is Used. Dispatched with Royal Mail 1st Class Large Letter. Vaux Brewery Original Vintage Slate Outdoor Sign. Vaux Brewery Original Vintage Outdoor Sign. This sign is slate and measures approx 40 cm x 29cm .A great collectors item. Condition is Used and shows signs of wear. Dispatched with eBay delivery – Shutl 1 day. Vaux Brewery Samson Ceramic Mug. Condition is Used. Dispatched with Royal Mail 2nd Class. Marks to inner base. Large ceramic tankard featuring one of the signature Vaux brews. Sound condition throughout, no issues. Vaux brewery bottle. Condition is Used but in good condition for age. The bottle has it’s stopper in with the Vaux sign on.Dispatched with Royal Mail 2nd Class. Tankard - Vaux - Winter Tipple. A VAUX COLLECTABLE TANKARD. The tankard has never been used. Condition - Very good and still in original box. VINTAGE VAUX BREWERY of SUNDERLAND - ASHTRAY - DUNN & BENNETT. "The best beer in the world is brewed by Vaux. The item is a tankard for Maxim Light and was issued in 1989. The tankard is in a very good condition. A COLLECTABLE BREWERY ITEM. Vaux Brewery Beer Bottle. Condition is Used and there is a chip to the top (see picture). Vaux and sons, Sunderland on bottle.Dispatched with Royal Mail 1st Class. This hasn't actually been drank out of, it's been in our loft for years. Wade PDM Vaux Breweries A-Z Good Pub Guide 1992 Large Mug . Condition is Used. Dispatched with Royal Mail Signed For® 1st Class. Measuring 4 inches tall and 6 inches from handle to rim. Please refer to pictures as they form part of the description. All items will be securely packaged and sent first class signed for. Please view my other items. Thank you. In excellent condition as shown. Unused & never put on bottles. The model is in perfect condition. The model is unboxed. A VAUX BREWERY TANKARD. Year of issue - 1989. ONE BEERMAT. BOTH SIDES OF THE MAT ARESHOWN IN THE PHOTOS.